Electronic Newsletters are a convenient way to keep in touch with your clients and let them know what is new with your bank as well as provide educational information on personal finances and/or content to help small business owners run their business. 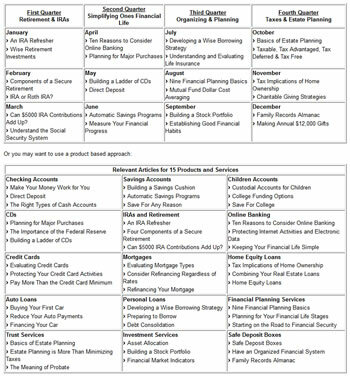 SBR’s Financial Wisdom content may be used for your newsletters, either online or hard copy. You have access to all of the content found in the Library of Content. You have the ability to modify or have SBR modify the content to fit your bank’s needs. SBR can work with you to help create your newsletter. We can assist in the literary calendar and we can send the newsletter to your approved list.